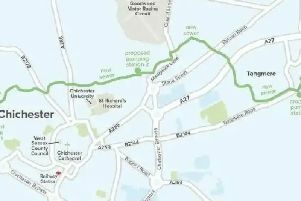 Approved plans to redevelop Chichester’s Southern Gateway are the ‘art of the possible’, according to Tory councillors. A masterplan for the area, stretching from the law courts to Canal Wharf, was agreed by Chichester District Council’s Full Council yesterday (Tuesday November 21), and includes plans for homes, commercial space, retail units, and other community and leisure facilities. But an amendment to commission further work to find alternative ways of addressing the issue of the two level crossings put forward by independent Andrew Shaxson was defeated by 33 votes to seven. The decision appears to shut the door on the Freeflow proposals, which would see a new bridge built over the railway line and the closure of both crossings in Stockbridge Road and Basin Road. Instead the council’s preferred highways option will see the access to the Stockbridge Road level crossing limited to buses, emergency vehicles, pedestrians, and cyclists, with a new bus and taxi interchange north and south of the railway station. Basin Road would be realigned with a new junction on Stockbridge Road, and modifications to the Southgate gyratory reducing the width and number of lanes to improve the pedestrian environment. Tony Dignum (Con, Chichester North), leader of the council, said: “If we don’t adopt the masterplan today we will prejudice the prospect of Government funding needed to prepare some of the key sites for development. “Development in the area would still take place but on a piecemeal basis and likely to be entirely housing with only a limited contribution to infrastructure and public realm improvements. An opportunity for co-ordinated development would be lost. He explained that the Freeflow proposals were too costly, would need extremely long ramps for the bridge, would impact both the character of the city and nearby flats, and would lead to the loss of too much developable land in the gateway area. But Richard Hutchinson and Martin Winch, the two Birdham-based architects behind Freeflow, continued to lobby the council to look again at their ideas. Mr Winch described the Southern Gateway as an ‘untapped opportunity and deserves a lot more vision than shown to date’, while Mr Hutchinson suggested the council had taken the ‘easy route’ when putting together the masterplan and ‘didn’t have the vision or the stomach’ for properly tackling the issues around the level crossings. In response Susan Taylor (Con, East Wittering), cabinet member for planning services, said she did not agree with the premise that the masterplan could not be visionary if it did not propose to remove both level crossings, and the current proposals would see the area redeveloped in a ‘way appropriate for the sensitive context of this part of the city’. Other ways to solve the problem of congestion leading up to the level crossings were suggested during the meeting, including a new bridge over the railway line west of the station from Terminus Road, or closing the exit off the A27. But several others argued that they should not be introducing measures to bring more traffic into the heart of the city centre. During the meeting Mr Shaxson (Ind, Harting) described how his amendment had been put forward because of the ‘outstanding concerns both of councillors and members of the public’. Jonathan Brown (LDem, Southbourne) suggested that if the council had put the bridge out for consultation as a possible option ‘we would be on safer ground’. Meanwhile Mark Dunn (Con, Westbourne) called moving back to square one ‘not a satisfactory solution’, while Bob Hayes (Con, Southbourne) added: “I do not want to see a bridge stuck in the middle of Chichester even if it does take away the level crossings. But Peter Budge (Con, Chichester North) suggested the issue of the level crossings would have to be addressed at some stage. Josef Ransley (Con, Wisborough Green) suggested a Chichester city-wide masterplan was needed to manage growth before a specific plan for the Southern Gateway was approved and labelled the current development proposals an example of ‘urban sprawl’. The Southern Gateway masterplan also covers the bus station and Stagecoach depot, Royal Mail sorting office, and land south of Kingsham Road. Officers explained that talks were in progress with both Stagecoach and Royal Mail about finding them alternative sites to relocate to, allowing redevelopment to go ahead. The councillors to vote for the amendment were: Clare Apel (LDem, Chichester West), Mr Brown, Gordon McAra (Ind, Midhurst), Steve Morley (Ind, Midhurst), Mr Plowman, Mr Shaxson, and Sandra Westacott (LDem, Fishbourne). The three councillors who abstained were: Elizabeth Hamilton (Con, West Wittering) as chairman, Mr Ransley, and Julie Tassell (Con, Funtington).